Collection of short stories by well known science fiction writers that either build on the Sherlock Holmes cannon or use it as a jumping off point for creating new characters. Some of these were quite good, some weird and some … well, they can’t all be great. 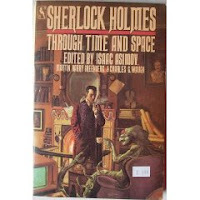 My favorites were the ones that took you further afield from the original stories – making Holmes a dog or a human who became smart by mind-swapping with an alien. It was a bit dated as a collection and that showed occasionally. Many of the stories were by big names in science fiction 30 years ago. Would love to see a more modern grouping. Get Sherlock Holmes Through Time and Space at Amazon.com. Noticed your tweet about this book…what a good blog this is! Happy to have found it.